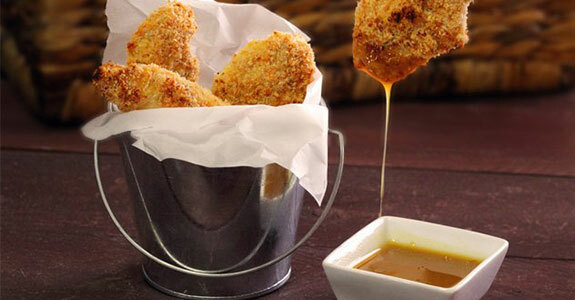 Honey mustard is so easy to love. It’s a bit spicy and a bit sweet. It can be a dressing or a dip or a sauce. It can be creamy or light. It goes with almost anything, from fruit to vegetables to meat. 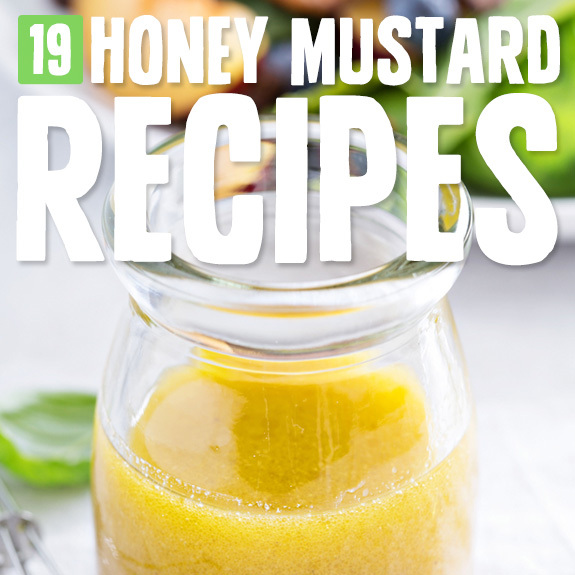 I’ve found a handful of paleo-friendly or paleo-adaptable honey mustard recipes to share with you, and I’m very excited about them! Some of the sauces come with accompanying recipes, so scroll on past if those dishes aren’t paleo-friendly. It’s that mustardy goodness you’re after, anyway. This sauce is the best of both worlds with a sweet and spicy honey mustard flavor alongside smoky BBQ flavors from tomato sauce, balsamic vinegar, maple syrup, onion powder, and smoked paprika. Someone’s having a BBQ tonight—that’s right, it’s me. When you start from scratch, good things happen. Such is the case with our homemade Paleo honey mustard that is anything but from a jar. This way you know that there’s only good-for-you ingredients and you know exactly when it was made. This sauce is also super simple with only three ingredients, but instead of vinegar with raw honey and Dijon mustard, this one gets a kick from sriracha sauce replacing the vinegar. I’d give it a taste and add more honey and mustard or more sriracha so the heat level is perfect for what you can handle. This dressing uses extra virgin olive oil, apple cider vinegar, whole grain mustard, pure honey (raw and local is best) with freshly ground pepper and real mayonnaise. 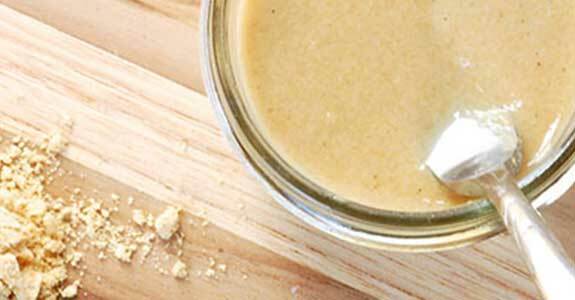 Use a paleo-friendly mayo or homemade to be sure you’re getting paleo-friendly fats. This recipe makes a honey mustard BBQ sauce that’s more sweet than smoky, to suit different tastes and different dishes. 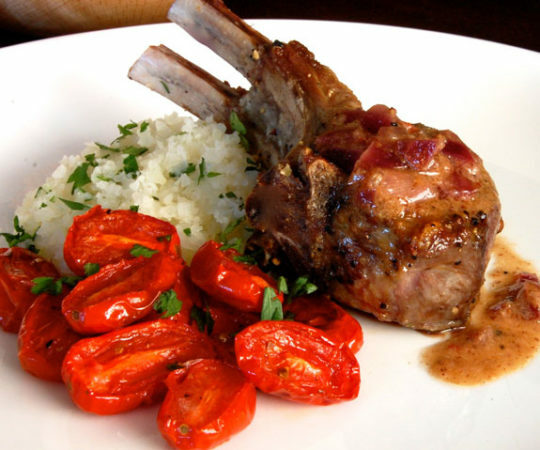 Replace the light brown sugar with coconut sugar, and check to make sure your Worcestershire sauce is paleo-friendly. 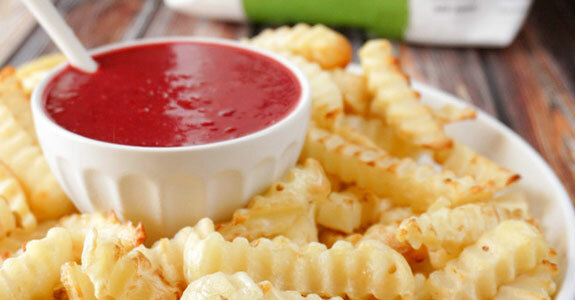 This sauce really couldn’t be any simpler with just three ingredients. You’ll need raw honey, Dijon mustard, and apple cider vinegar. Use this as a dipping sauce for meats, kebabs, vegetables, or whatever else you can think of. Honey mustard makes (almost) everything better. This extra-zesty and beautiful honey mustard sauce goes beautifully with sweet potatoes (or other vegetables) and uses two varieties of mustard (traditional and whole grain, both Dijon) as well as honey, lime juice, and salt for a citrusy kick and extra flavor. While honey is paleo-friendly, there are reasons why you might want to avoid it—maybe it’s preference, or you’re having vegan friends for dinner! Not to worry. 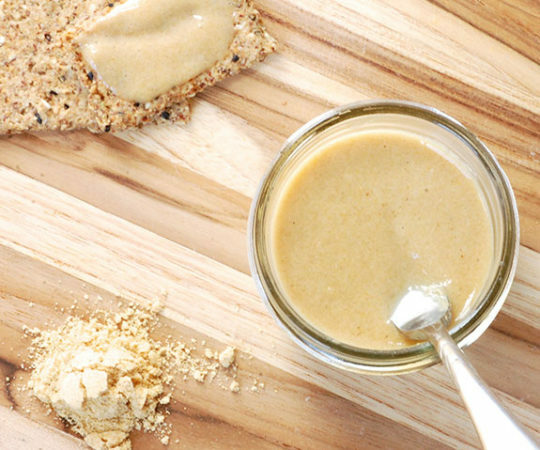 This honey-free sauce uses creamy salted cashew butter for richness, spicy mustard, and maple syrup for a sweet finish. This is an easy, 4-ingredient vinaigrette (and 2 bonus dressing recipes, though one is not paleo) using mustard of your choice, balsamic vinegar, honey, and olive oil. 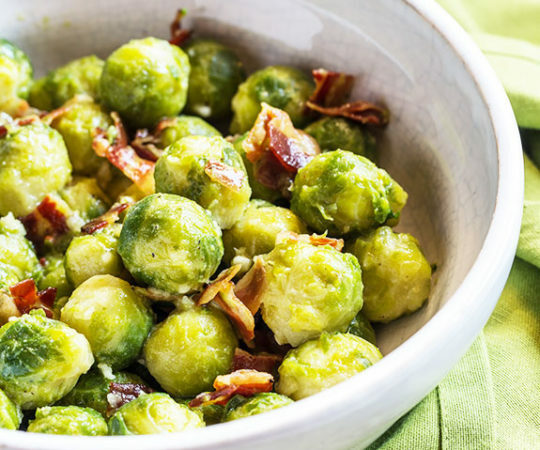 The use of balsamic over apple cider vinegar or white vinegar ensures a super savory-sweet flavor. This creative sauce is sweet, spicy, and beautifully red. You can replace the sugar with coconut sugar, but if you’ve been eating paleo for more than a few days, it’s likely that you’ll find this sauce sweet enough with just the honey, and you could leave out the additional sweetener. This honey-free sweet-and-spicy dressing is a twist on honey mustard that uses Medjool dates (my favorite variety), sea salt, black pepper, garlic powder, olive oil, apple cider vinegar, and water to thin the dressing to your preference. It’s easy and delicious. This is another honey-free “honey” mustard dressing using grade B maple syrup (higher in minerals and nutrients), basil, garlic, black pepper, white wine vinegar, Dijon mustard, and extra virgin olive oil. It’s sweet, elegant, and sophisticated, and it tastes so good. Make sure you use paleo-friendly mayo in this recipe. It’s such a small amount that you might even be able to get away with using coconut yogurt! The drops of lemon juice give this dressing slightly tang, and it’s creamy, sweet, and spicy, too, for the ultimate flavor party. 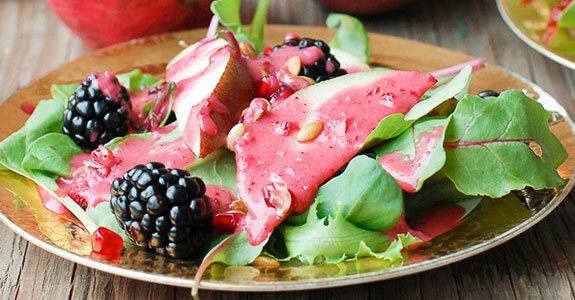 This dressing has a lovely pink color and beautiful, warm flavor. It’s made with fresh cranberries, honey, apple cider vinegar, dry ground mustard, shallot black pepper, and avocado or olive oil (to replace the grape seed oil that the recipe calls for). 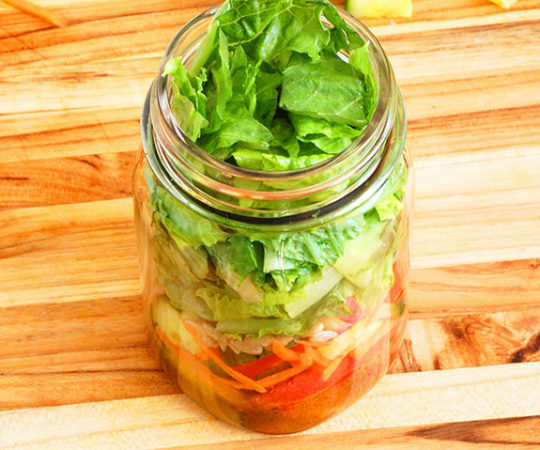 This bright dressing takes homemade to a new level. Made completely from scratch, it begins with yellow mustard seeds, dry white wine, honey, dried dill, turmeric, and a bit of salt and black pepper. Turmeric acts as a natural aid to the bright yellow color of the seeds. For an extra fun flavor in your dressing, try this garlic honey mustard vinaigrette made with olive oil, red wine vinegar, ground mustard, garlic, and honey. Honey and garlic go really well together, and for an extra delicious flavor, try infusing your honey with garlic for a week or so beforehand. You’ll want to use either store bought paleo-friendly mayo for this recipe, or use homemade. This is a milder dipping sauce with an intense creaminess from the mayo and just hints of spice and sweetness from the Dijon mustard and honey. 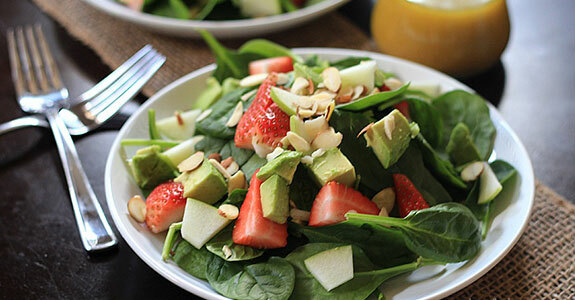 This dressing would be lovely in any fruity salad like the one pictured. It’s made with mustard, raw honey, white vinegar (you could use apple cider vinegar if you wanted to), olive oil, and salt and pepper to taste. Simple, delicious, and homemade. For the simplest, fastest, and easiest honey mustard dipping sauce recipe yet, try this one with just honey and spicy brown mustard. 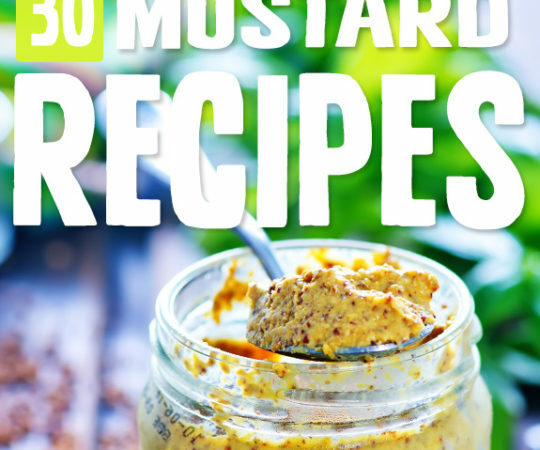 As always, make sure your mustard doesn’t have any non-paleo additives in it. You can also adjust the ratio or honey to mustard here, if you want. 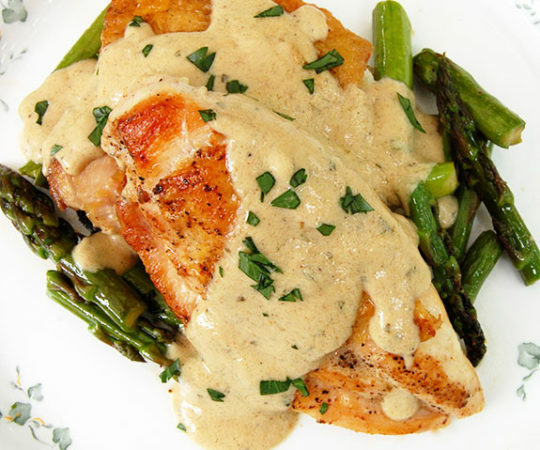 This sauce is also creamy from mayonnaise (use paleo-friendly or homemade), Dijon mustard, honey, and a bit of salt. This time we’ll add onion powder for an additional savoury note that makes this sauce a bit more complex and goes especially well with chicken.